snips snippets: Long Time Gone Sew-along Sponsors! Long Time Gone Sew-along Sponsors! Today is the day!!! Well, not the day. We're not starting yet. No, today is the day we get to share with you some of the wonderful prizes our generous sponsors have put together for you! And wow, you guys are so lucky! These prizes are awesome! We're working hard behind the scenes to help everyone get access to the pattern, fabrics and some amazing prizes. Pulling something together on this scale across the globe takes a lot of coordination and communication and we've done our best to find stockists and supplies for every area and budget. Because of the nature of this type of event we'll be continually updating information as it comes to hand so be sure to check back regularly. To help everyone get their supplies together for the Long Time Gone Sew-along we've been collating information about where supplies can be found. This is not an exhaustive list, but it's places where we know there's stock available. You can always check with your Local Quilt Shop as well to see if they have what you need. Angie has put together a page where stockist information will be kept will update as we get information. You can find it by clicking here. If you know of a shop that is carrying the pattern, please feel free to leave a comment or email either Angie or myself. Thanks! Because we understand just how demanding fabric selection for this type of quilt can be we've teamed up with our favourite people to bring you fabric bundles that will help you get a cohesive and beautiful quilt. We'll have information about the bundles and some coupon codes to help you get supplies when we talk about fabric selection on Wednesday 25 January (Angie's time) Tuesday 24th (my time). You're not going to want to miss out on these curated bundles from Alison Glass, Anna Maria Horner and Amitie Textiles. The use of templates is not compulsory, the quilt top can be made by following the pattern, however if you like the increased accuracy, less fabric waste and the ability to easily fussy cut your blocks then using templates can be just the thing you're looking for. While we know that the thrill of making a quilt is it's own reward we also know that there's nothing sweeter than winning something wonderful from someone fabulous. We've been truly lucky and blessed to have the following designers and businesses donate prizes for those that participate and finish their quilt top. There will be one winner for each prize on offer; that's pretty good odds! Alison Glass Studio has kindly donated a fat quarter bundle of Handcrafted Chroma (yet-to-be released, but I hear it's to die for), a set of all of Alison Glass' quilting patterns and a large box of Alison Glass Aurifil thread. Andover Fabrics has kindly donated a Fat Quarter Bundle of Sunprint 2017. That's 27 fat quarters of amazing saturated awesomeness. Anna Maria Horner has kindly donated not one collection but both collections of Luminous. One lucky person will win a fat quarter bundle of Luminous I and Luminous II. Free Spirit Fabrics is also donating a curated fat quarter bundle of Luminous for one lucky winner. It's sublime, you'll want to win this prize! Jen Kingwell's Amitie Textiles has kindly donated a $200 Gift Certificate for one lucky winner. You'll be able to get fabrics, patterns, notions and more! Marti Michell has kindly donated a $100 Gift Certificate for one lucky winner. Marti's templates are so well priced that you'll be able to get a wide selection of templates and rulers - perfect for any sewing studio! 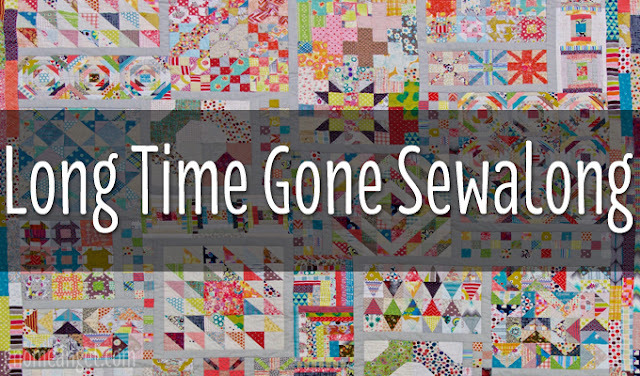 Love Patchwork & Quilting has donated a 1 year subscription to Love Patchwork & Quilting. One lucky winner will get to spend 12 months with Angie and I as we grace your mailbox once a month! And that's not all, we're still in the process of locking in some other great sponsors all of which will be announced when we kick off on March 15. We're really excited about these prizes and offers and we can't wait to share more with you over the coming weeks. We hope you're as excited about it all as we are! See you next week when we'll talk fabric selection, discount codes and reveal a little more about how you can win big! High fives for our sponsors! Did you honestly think I would leave without another sneak peak of my LTG?! looking forward to this scrappy-love madness!! It's going to be a fun time for sure!! Just got my pattern in the mail. Can't wait to get started. Yay!! Glad to have you sewing along with us! Looking forward to starting this one. As luck would have it, my local quilt shop, Quilt Junction (https://www.quiltjunction.com/) is starting this as a BOM in March! So, double the fun....an online BOM and a reason to visit my LQS!!! I'm very very excited to get started on this project. I did make my own version of My Gypsy Wife last year so know how wild some of Jen Kingwell's patterns can look at the beginning. As soon as I was finished, I started looking for a quilt along so I would have some support on my next journey. This is it! I purchased a bundle of Alison Glass FQs to add to my stash and cannot wait for it to arrive. Confession time...I am working ahead on some of the blocks that require lots of smaller units. I have about 56 flying geese made (many leftover bits from previous blocks...it pays to save scraps, i blogged about this QAL last week and will keep doing so as we go along. Check it out here GRANNYcanQUILT.wordpress.com. Will there be an Instagram feed? I hope so because I love looking at what others are doing for inspiration. Hi! I'm replying here as you're a no reply blogger. I'm so happy to have you sewing along with us! We're going to have so much fun! We don't have a dedicated Instagram feed for this adventure but we will be using the hashtag #LongTimeGoneSAL for all our related posts. Both Angie (@gnomeangel)and I will be posting regularly each week once the official start date rolls around so stay tuned! Hello! I'm still on the fence with this sew along just because I have so many other projects going! I was wondering: is anyone eligible for the prizes? I mean internationally I know some of the 100 days prizes were only Australia. All the prizes are available internationally so everyone will have a chance to win one of our fantastic prizes!! 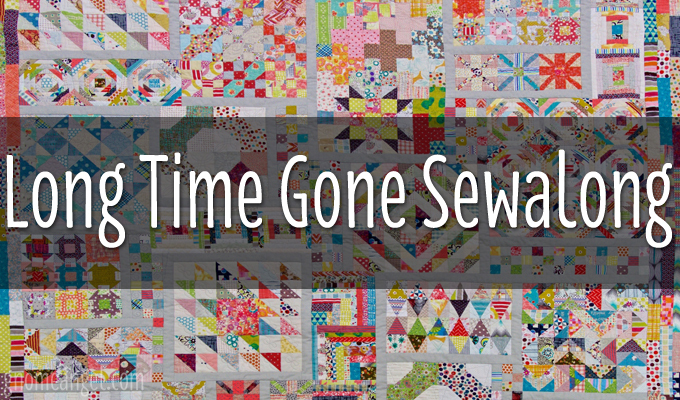 Welcome to the Long Time Gone Sew-along!